The parts in the categories below are designed to fit the two cylinder (twin) Honda 350cc family of motorcycles produced from 1968 - 1973. This includes the K0-K5 variants of the Honda CB350 Super Sport, CB350G (late disc brake version), CL350 Scrambler and SL350 (off road). 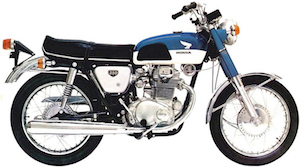 Our Honda CB350 / CL350 / SL350 FAQ answers many commonly asked questions about these bike models.